So naturally when my mother announced that she would like to celebrate her 70th birthday in the DR, an island she also always wanted to visit, I jumped at the opportunity. This is a quick recap of the ten days we spent there. After going through all the usual (and unusual) arrival procedures at Las Americas airport, my mom and I made our way to the arrival hall, where we were greeted by my brothers, who had arrived an hour earlier from Belgium. The expected screams of joy and happy hellos were exchanged before we could proceed to the taxi stand. The drive to the capital of Santo domingo, where we would be staying for the next 10 days was rather uneventful, except for the fact that the driver could not find out street. After calls to the taxi dispatch, other drivers as well as the driver’s brother asking for directions, we finally pulled up to a beautiful 16th century house smack in the middle of the Colonial Zone. Our quaint little street was filled with colorful old buildings and our “little” accommodation looked to be the largest of all, with a heavy wooden door and beautiful large windows opening up to the street on one side and a beautiful square on the other. Once inside we were amazed by the size of it. The pictures on AirBnb did not do this place justice. It was like we stepped right into a Gabriel Garcia Marquez novel. A rather large living area, tastefully decorated with antiques as well as modern furniture greeted us. A bedroom, complete with its own bathroom and four poster bed was located in the back next to the small kitchen, which opened up to a beautiful patio with stairs leading up to the master suite on the second floor and an amazing rooftop. Ah the rooftop. It offered a spectacular view of the square below and the old church on it. We took a stroll to the nearby Malecón and into the real Santo Domingo where we found the cutest little artsy restaurant with traditional Dominican cuisine and Spanish rock music playing in the background. Rocker and foodie chick that I am, I was in heaven. We sat there for what must have been 2 to 3 hours. What a gem of a place and totally affordable too. $40 US$ for main course, additional side dishes, water, juices and beers for 4 people. Gotta love that exchange rate. My friend Lela, who drove the 3 to 4 hours from Punta Cana just to see me, met us there. It was a joyful reunion as I hadn’t seen my crazy friend for almost 3 years. That evening we feasted at Pal’e Palo, a gorgeous restaurant that came highly recommended by friends. The restaurant is located on the Plaza de España, a square surrounded by historical buildings, including the oldest Viceregal residence in America, the Alcazar de Colon. Day 3 was spent cooped up in the house with immense pain due to my endometriosis. Well played, endo. Well played. Thank God for my friend Lela who stayed in with me and played nurse the whole day, while my family went exploring more of the city. It was a day of heavy rain and thunder and the poor souls came back absolutely soaked. We decided to rent a car so we could explore more of the country. Before we started the drive outside of the city we stopped at the Irie Lion, a vegetarian restaurant around the corner from the house owned by a Dominican Rastafarian. I think the pain meds I was on must have kept me calmer than I would have been without them. The drive to the beach town of Boca Chica was, to say the least SCARY! Dominican drivers seem to not care about indicators or lines on the road or traffic rules in general. I saw it all: three cars on a two lane road, cars stopping on the highway, pedestrians crossing the busy highway and a naked man chilling on the side of the road. Boca Chica is a touristy beach town that has definitely seen better days. After a quick drive through the once famous Boca Chica we continued on to the next beach town of Guayacaná, a small fishing village with little shacks along the beach selling fish with tostones (fried plantains), where we stopped for a beer before heading back into the city. That night we treated our mom to a night out on the town at a restaurant in the Zona where she was serenaded by the staff as well as street musicians singing Spanish ballads and “Feliz Cumpleaños”. Seeing her smile and enjoying herself was needless to say absolutely priceless. Day 5 was ladies day. Lela and I met up with a fellow blogger living in Santo Domingo. Jen from Drinking the Whole Bottle has a hilarious blog about her island adventures and like me, is a contributor on the super funny blog Women who live on Rocks. Jen brought an island newcomer to our lunch, Zan. Let’s just say that after the first cold Presidente beer we were all fast friends and just couldn’t end the day at lunch. So up to our rooftop we went, where two chilled bottles of bubbly awaited us. It was a Thirsty Thursday to remember. My brothers and mom made their own plans for the evening, leaving Lela and I to fend for ourselves. We took Jen’s advise and checked out La Alpargatería, a shoe store/lounge/tapas bar complete with delicious cocktails and funky toilets. Yes, you read that last part right. It’s a must visit if you ever find yourself in the Colonial Zone. Lela asked me to join her on her drive back to Punta Cana where I would spend the night at her place before taking the bus back to the capital the next day.The long drive took us through the famous Casa de Campo in La Romana, Playa Bayahibe, San Rafael de Yuma and Boca de Yuma before reaching our end destination of Punta Cana. We stopped somewhere after Bayahibe at an animal shelter and doggy hotel to pick up Lela’s senior pooch. I’m a sucker for dogs and cats and must have shot about a hundred photos of the many fur-babies at the shelter. I fell in love with several of them and it was real struggle not to adopt one or two. Shout out to Yelena from “Collares Rojo” or Red Collars organization. She has the emotionally heavy job of taking care of the areas’ many homeless, abandoned and often abused animals. We stopped for a late lunch in Boca de Yuma, a sleepy little fishing village with food shacks selling the most finger licking fried fish with tostones. I washed it down with a frosty Presidente beer, all while enjoying the view of the ocean below. Seriously, the beer here is colder than anywhere else. Day 7 – What time is the bus? I have a gay bar to get to. It was time to head back to my family and the familiarity of the Zona, so Lela dropped me off at the bus terminal where I boarded a very loud and crowded bus with shockingly comfy seats, cold air-conditioning and wi-fi back to Santo Domingo. It seems that whenever you get a group of Dominicans together there’s always loud music and animated conversations. This bus was no exception but it made for a pleasant drive. That night was spent with my brothers. I only see them once every two years if I’m lucky, and a little sibling bonding was well needed. They took me to my first latin gay club. What an absolute must-do whether you are straight or gay. It was an incredible experience. One where as a woman I was not judged or harassed. The gay scene in the DR is incredibly open and inviting. It is something so rare in the Caribbean, where the macho culture is still so dominant. We hit about two gay bars and a transvestite pageant show before heading home at 4 am. The day was spent looking for the Jima waterfall in the little town of Bonao. It’s amazing how fertile, green and mountainous this part of the DR is. For more on my Jima experience, read my post El Salto de Jima. From lush green forests and waterfalls to a total desert area complete with salt mines and sand dunes, Baní is the opposite of Bonao. Read all about our experience climbing the dunes and the pretty salt mine we saw on the way in my blog post Playa Salinas and the Dunes of Baní. Just like that 10 days in the Dominican Republic flew by. What an adventure it has been. I spent the last day by myself strolling the streets of La Zona Colonial and chasing murals in a neighborhood on the outskirts of the Zona called Santa Barbara. It’s famous for its many murals by local artists. It is unfortunately also a very unsavory part of town and I was warned by the locals to put away my gear to avoid getting robbed. I did get some amazing shots before I quickly walked back to the safer part of town for a well deserved Cosmopolitan at what became one of my favorite restaurants in the Colonial Zone, Pat’e Palo. Thank your for reading this very long post on my DR experience. I hope it is of help to those planning to visit this very diverse island. Don’t hesitate to contact me for more information. Although there were a few disappointments here and there, the crime, garbage everywhere and the many stray and abused animals to name a few, there were also much beauty to experience in this country. The people, for instance are incredibly hospitable and friendly, not always with an agenda and the landscape of the island is so diverse and stunning. It’s amazing what all you get to experience once you stay out of the all-inclusive resorts. 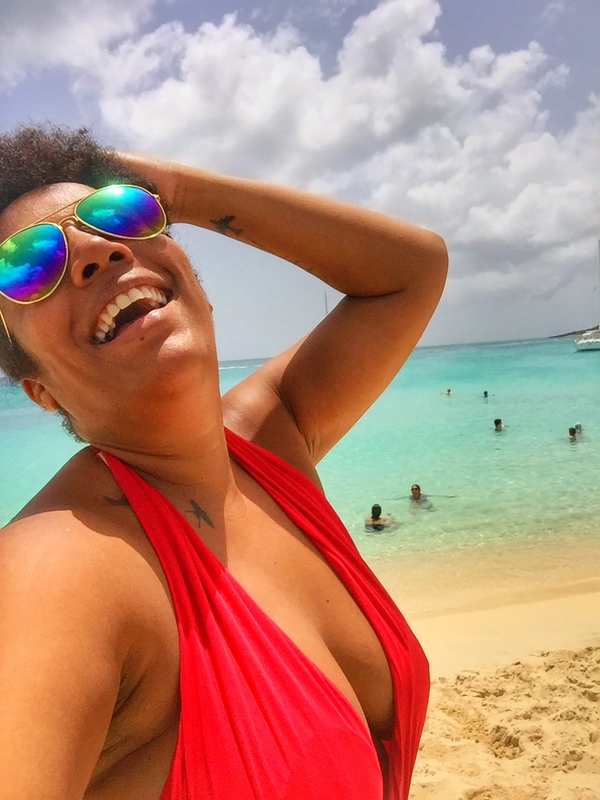 A big thank you to my friend Lela who took the time to hang with me and my family and show me some interesting parts of the Dominican Republic. Then there was Jen and Zan, you girls were awesome. Thanks for a great Thirsty Thursday. And of course my brothers, Pietro and JJ for making us breakfast every morning. What can I say? I’m spoiled like that. That looks like a corner of paradise, I’m loving your blog. Thank you and I definitely will take a look at your blog. Wow! You TRULY nailed your visit to DR. There are places I’ve never heard of but will go visit now because of you. I can’t wait to meet up again for a 2nd Thirsty Thursday. Come see me here so I can take you around. I will definitely revisit the DR though. So many more places I didn’t get to see. It’s an impressively large island. Miss you, my friend.